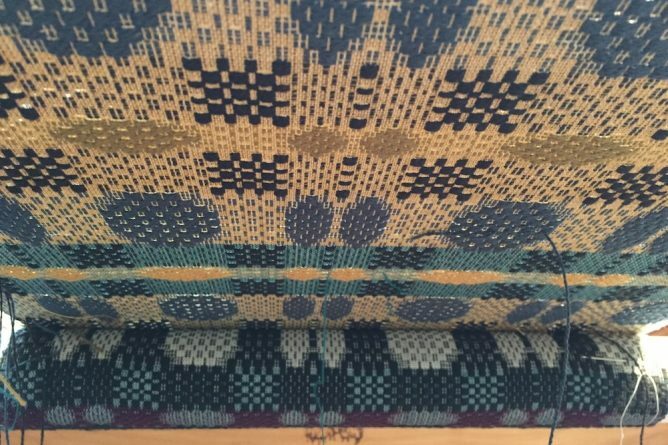 Back in the fall of 2016, I was registered for a class on 18th and 19th century handwoven textiles with Marjie Thompson. Each of us in the workshop was going to set up a loom ahead of time with a specific pattern. We’d bring our looms to the workshop and, during the weekend, we would all go around and weave a sample on each person’s loom. By the end of the weekend we would have lots of samples of different patterns. I was very excited. I got my draft in the mail. A draft is the plan for a weaving project that tells you how to set up your loom to weave that particular design. I wound the warp, threaded my loom, organized the tie-up, wove a sample, and then got sick. I wasn’t able to attend the actual workshop.